TradingView is a powerful trading platform that delivers real time market information and market insights. It is simple and intuitive for beginners to understand, yet still provides the more advanced trader with extremely useful tools to use. It is not only a charting suite but also a social community for traders to come together to learn, discuss, and share ideas. These two aspects together make for a great source of information that every binary options trader should utilize. It is browser based, which means you can do your market research and connect with other people from anywhere in the world with an internet connection. Typical binary option brokers will not offer the extensive trading tools and resources that TradingView has. More often than not, the only information many binary option trading platforms provide is a simple line graph with the price of the underlining instrument that is being traded. That is just not enough information to make an informed decision and place a successful trade. If you want to be a successful binary options trader, then it is advantageous to use an outside professional charting platform. This is where TradingView will come in handy. They offer a variety of features that will help any trader perform better. These resources include an advanced charting suite, custom Pine Scripts, and social sharing of trading ideas. All of these can become powerful tools for a binary options trader to use and deserve a more detailed look. As you can see, the interface combines a large amount of different information and displays it nicely on a single page. Daily price ranges, headlines widget, conversation/chat widget, and watch lists are all offered. On top of that, a user has the ability to apply almost every technical indicator used by traders. A large amount of these is built into the platform while even more are available through Marketplace Addons. There is also over 50 different drawing tools to choose from, so you can always effectively visualize your market analysis. Currently, the platform does not offer an option to place direct trades with any binary options broker. However, you can use this platform to perform your analysis on almost every major index, commodity, stock, or currency that binary brokers offer. After you perform your analysis, you simply place the trade with your broker. This is a high-value method to use and will increase your chance of placing a better trade. With a little bit of research and practice, anyone can use Pine Script. Traders can either create custom indicators to apply to their charts or even modify existing ones. Either way, this is a great way for traders to enhance their strategies and come up with new trading signals to look for. This is an area of TradingView that can be a very potent resource for traders. One of the best ways to gain insights on a financial market is to connect with others who are trying to do the same. TradingView offers a live chatroom specifically for binary option traders. With this, you can directly see what others are saying about the markets and what trades other people are making. This is also a great way to get instant feedback about your own strategy before you decide to place a trade. More often than not, a trader is alone in front of their computer, relying only on themselves to figure out what trades will be profitable. The chatroom provides an invaluable resource and could be a place to find the most useful information on a daily basis. Another unique feature that this platform has is their Idea Stream. This is where traders publish charts, strategy, and whatever insights they want to share with the community. Authors that post regularly with accurate charts and information become Top Authors. You can follow these authors and have what they post sent to your personal stream. The insights that can be gained from these traders are extremely beneficial. Any trader should use these insights to develop their own ideas and strategies for lucrative binary option trade setups. If you are a non-native English speaker, TradingView has active communities also in Spanish, Turkish, Russian, and Japanese languages. TradingView gives a trader countless benefits. First, this is one of the first platforms that is not based on obsolete technologies such as Java, Silverlight, or Flash. The entire platform is built around HTML 5, which means that it is supported by any device. This prevents compatibility issues someone may have and lets all users access it easily. Secondly, the charting suite itself provides easy-to-use and worthwhile tools that every binary options trader can employ as part of their trading strategy. 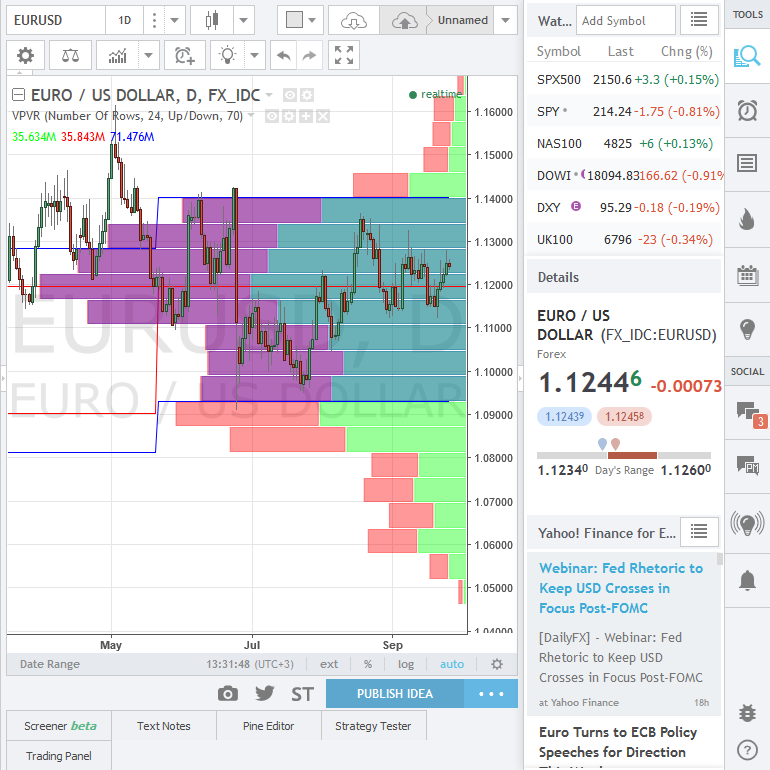 Thirdly, the Pine Script programming language allows a trader to fully customize their charts to allow for a more accurate and well-defined strategy. It gives the user a great ability to create effective trading signals and visualize market setups more precisely. Lastly, their idea sharing and social trading areas provide information not found anywhere else. If you want to connect and share with other binary options traders, this is a great place to do so. Overall, this is an excellent charting platform to use in conjunction with any binary options broker.